All visitors should obtain a parking permit from Parking Services located on the first floor of Clifton Robinson Tower. You may also obtain a permit in advance by going to Vistors Parking. Parking services will e-mail a temporary permit to you. Parking is available in the Parking Garage at 4th and Speight Streets. Welcome to The Texas Collection in Carroll Library. Please check in at the circulation desk when you enter. You will need to complete a registration form with the reading room monitor and present some form of photo identification (student ID, driver's license or passport). Backpacks, book bags, briefcases, coats, purses, computer cases, notebooks, and umbrellas are not permitted in the reading room. Pick up your locker key at the circulation desk and deposit those materials in a locker. When you enter the reading room take only a note pad, pencil, and a laptop. Cameras are permitted in the reading room but permission must be granted before use. Cell phones are permitted but they must be set on silent. You will be asked to leave the reading room if you accept or make a call. 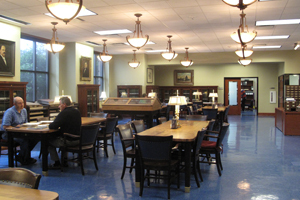 The Guy B. Harrison, Jr. Reading Room is supervised by a monitor. All materials must be used in the supervised reading room. The monitor is present to assist you with your research and to safeguard Texas Collection materials. The monitor will check with you periodically to ensure you have the materials you need for a successful and productive visit. At the end of your visit, the monitor will look over your materials and the Texas Collection materials to make certain all items have been returned to their original folders and boxes. Please sit facing the room monitor when you use materials. The monitor can observe who is using archival materials, who is using library materials, and who is studying. The monitor is there to help you if you have questions, feel free to ask the monitor when you need assistance. Keep all materials in the same folder and in the same order in which you found them. Be careful when handling archival materials. If you find papers and other items in poor condition, please let the monitor know. Finally, a researcher may only have two boxes of archival materials or one box of photographs on your table at one time; please remove one folder at a time from a box. When finished with those boxes request a new set. No tobacco products, food or drinks are permitted in the reading room. These items can damage materials. If you have any of these items, please deposit them in your locker. A KIC scanner and flatbed scanners are available for use to copy materials. Please bring along a flash drive to digitally store your documents. Photocopies of documents are available but at a fee. The Texas Collection strongly encourages researchers to make a digital copy rather than a photocopy. In either case, a Request Form for Copying Materials needs to be completed. You need to list every scan, copy, or photograph made. If you intend to publish using Texas Collection materials, you must request a Permission to Publish Form. Only 40% of any collection may be copied. If you need to leave the library for any length of time, give the materials to the monitor and let the monitor know you will be returning. If you do not intend to return that day but will be coming back within the next few days, let the monitor know so the materials are not filed back on the shelves. Some archival materials may be restricted. These restrictions apply when a donor requests some items be closed for a certain period of time, or for other reasons such as privacy or fragility of materials. If there are restrictions of materials for any reason, The Texas Collection will honor those restrictions. If the Texas Collection does not own the copyright to the materials you will have to request permission from the owner of the materials to use them in any published form. The Texas Collection is not responsible for any libel laws, copyright infringement or any other laws that apply to the materials you use.